Nestled near Lake Norman, this community is known as an ideal weekend destination just north of Charlotte. Birkdale Village provides a complete one-stop shopping experience in an inviting atmosphere on a main street setting. It has the perfect combination of retail, office and residential units. The center has over 60 retail shops, 10 restaurants, service providers, a 16 screen theater plus a one-of-a-kind interactive fountain. Located in Huntersville, NC, this beautiful community is only 30 minutes north of Charlotte. The economic make up of Huntersville includes a mix of middle and high income families and numerous vacation homes. Crafters are also encouraged to apply, as a separate Crafters Market will be included in the event. Please apply through ZAPP and chose "craft section" as your category. We return to the fabulous downtown streets of Legacy Village in Ohio to put on one of our greatest and longest running shows of the season. Shutting down the streets to create an exclusive art experience, we bring 100 of the country’s leading artists and fine crafters to the affluent Cleveland suburb Lyndhurst-Beachwood. Legacy Village provides the perfect ambience for our art festival by providing a venue already established with fine dining, designer boutiques, and upscale retail stores along its streets. To ensure all artists and enthusiasts alike do not miss our arrival in Lyndhurst-Beachwood, we promote this exceptional art festival through all available media. This show also has a convenient Friday setup. Crafters are also encouraged to apply, as a separate Crafters Market will be included in the event. Please apply through ZAPP and chose "craft section" as your category. Nashville’s largest suburban city, historic Franklin is the location for Howard Alan Events’ newest addition to its award-winning line-up of events: The Nashville National Art Festival. Featuring an elegant, Victorian-era downtown, Franklin is one of the fastest-growing cities in the state. The Nashville Fine Art Fair premieres at the popular, upscale CoolSprings Galleria mall, and features an unparalleled array of carefully vetted works from the nation’s top artists and artisans. The Nashville National Art Festival is conveniently located between Mallory Lane and I-65 and includes a Friday set-up for artists. Crafters are also encouraged to apply, as a separate Crafters Market will be included in the event. Please apply through ZAPP and chose "craft section" as your category. Asheville’s historic Pack Square Park is the picturesque back drop for the Downtown Asheville Festival of the Arts. The show is set up on the streets of North Pack Square and South Pack Square around the Vance Memorial. The park is a regional landmark has been a focal point since the city’s creation in 1797, lying at the intersection of ancient trading paths. Crafters are also encouraged to apply, as a separate Crafters Market will be included in the event. Please apply through ZAPP and chose "craft section" as your category. There will be no green market. Keystone Resort, located at the base of Loveland Pass, is the closest luxury resort area to Denver. This vacation resort is home to great hotels, restaurants and fine shops. Keystone has the largest ski mountain in Summit County. The show will be held in River Run Village at the base of the mountain. Anticipate great crowds, high end buyers in a beautiful village setting. Beaver Creek is one hour away and Downtown Denver is an hour and a half away from Keystone. The Flats East Bank is more than Cleveland’s best place to eat, drink, play and live. It’s flat out electric. Rising at the union of the Cuyahoga River and beautiful Lake Erie, the Flats East Bank is a lifestyle all its own, with cutting edge waterfront living and a combination of dining and entertainment options you won’t find anywhere else. Show is currently closed to jewelry. Jewelry applications will be juried for wait list only. Our cornerstone event returns triumphantly with a massive crowd following. This historic and artistically-inclined area of Fort Lauderdale is an ideal setting for an art fair. All artwork is juried, which provides a higher level of quality, diversity and creativity of art on display, exemplifying the gifted artists in regions from all over the country. Come experience the show that put Howard Alan Events on the map! This festival is located on beautiful Las Olas Blvd between SE 6th Avenue and SE 11th Avenue. The Festival will take place at UTC (The Mall at University Town Center). UTC is located in a very affluent part of Sarasota directly next to Lakewood Ranches with great exposure to I-75. UTC is a world-class fashion and dining destination featuring Saks Fifth Avenue, Macy's, Dillard's and over 150 stores and restaurants. Many distinctive retailers at UTC are not found anywhere else in the local area. UTC offers a diverse mix of fashion and lifestyle retailers, popular favorites, sit-down restaurants and a children's play area. This application is for the art section of the festival. 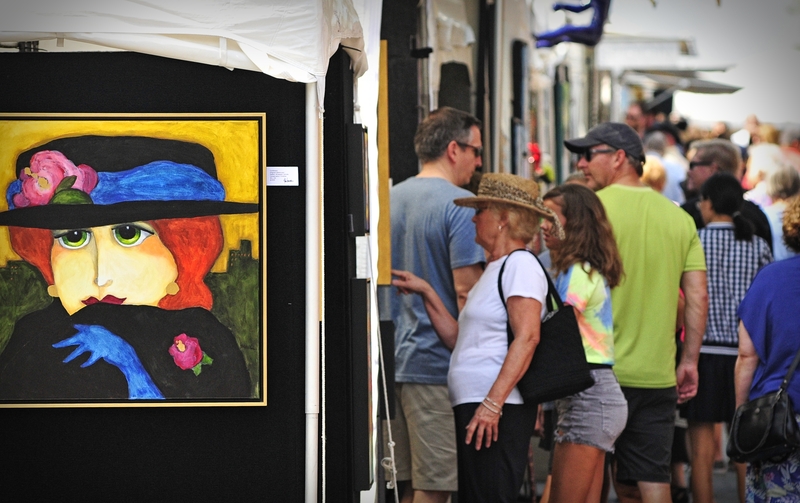 Nestled within this tropical paradise, St. Armands Circle Art Festival attracts thousands of art-loving visitors who are eager to purchase fine and unique works of art. The people and location make this show a success year after year. Show is currently closed to jewelry. Jewelry applications will be juried for wait list only. Coconut Point is located between the borders of Estero and Bonita Springs just between Naples and Fort Myers with a robust population that exceeds 290,000 people.